In 2006, David Geldart, the then Director of Physical Education and Sport at St. Mary’s, Menston, visited South Africa as part of a British Council and Youth Sport Trust initiative to promote sport in the country’s most deprived areas. As a direct result of that visit, St. Marys and Mnyakanya High School in KwaZulu-Natal developed a unique partnership using sport to inspire young people in both countries. The two schools named their collaboration the ‘Bambisanani Partnership’ – Bambisanani being the Zulu word meaning ‘working hand in hand’. The partnership has subsequently gained international acclaim for its ‘pioneering and inspirational work’ using the power of sport to promote education, health, global citizenship, enterprise in one of South Africa’s poorest rural regions. Ten years on, the partnership has become a multi Award winning charity chaired by David Geldart and led by Mrs Catherine Chattoe at St. Marys and Mrs PK Zondi in South Africa. Mnyakanya High School is situated in the rural and remote Nkandla region of KwaZulu-Natal, South Africa. The school, in the heart of traditional Zululand, was opened by Nelson Mandela in 2004 and is located in one of the most deprived areas of South Africa with high rates of HIV/AIDS, unemployment and adult illiteracy. The area has one of highest rates of AIDS orphans in the world. Class sizes are in excess of 60 and the school has very limited resources. Despite all this, Mnyakanya provides an oasis of hope in the area and many students walk two hours, each way, for the opportunity to receive an education. Sport has driven the Bambisanani Partnership and has been the catalyst for whole school developments at both St. Mary’s and Mnyakanya. Over the course of the past ten years the Bambisanani Partnership has become part of each school’s identity. Teacher and student exchanges, joint learning projects involving almost all areas of the curriculum have enriched teaching and learning at both schools and empowered the partnership. A fundamental factor in this success has been whole school involvement, engagement and support of Governors, Senior Leaders, teachers, parents, students and the wider community including supporters and sponsors. The visits to and from each country have had a significant impact on those involved. Students from St. Mary’s who visit South Africa prepare for more that eighteen months in advance. In addition to the necessary fund raising and advanced leadership training, students are involved in a learning programme that covers topics such as Apartheid, South African history and politics, Zulu culture and traditions, HIV/AIDS awareness and Zulu language. When in South Africa the students (normally lower Sixth Form) mentor twenty Mnyakanya students through the ‘Bambisanani Leadership’ programme, taught through sports activities. At the end of the programme, the students from both schools have the responsibility of jointly planning and delivering a community Sports Festival and a community Reading Festival for over 150 primary school children from the Nkandla region. Significantly, even the Reading Festival uses sport to great effect. Beyond the leadership mentoring, St. Mary’s students also coach a range of specific sports and teach academic subjects at Mnyakanya, and sports and reading at Ntlowane Primary School and Zulufadder Orphanage. The annual visits to South Africa have also included primary and secondary colleagues in order to encourage this kind of development in other schools. Business sponsors and supporters have also visited the project. Beyond annual visits, the majority of Faculty areas at St. Mary’s have used the partnership as a stimulus for learning. Exceptional work in Religious Education, English, Languages, Humanities, Technology, Drama, Art and Music has further embedded the collaboration. Joint learning projects in Art and Creative Writing based on the theme of ‘The Power of Sport’ inspired over 650 students from both schools to voluntarily enter age related competitions. The work has since been exhibited in both countries and prints sold internationally. ‘Bambisanani Enterprises’ is a student led business that exists in both schools with the purpose of teaching enterprise skills and raising funding for the partnership. Business sponsors in both countries have given their time to mentor students involved. The partnership has also developed the Bambisanani Award scheme. To gain the awards at Bronze, Silver and Gold level, students have to successfully complete independent learning projects on Leadership, Social Justice, Global Citizenship, Enterprise, Volunteering and Community Engagement. St. Mary’s and Mnyakanya both now work with other schools to encourage them to also develop international partnerships. This involves working with schools individually and speaking at conferences about the Bambisanani Partnership and the benefits of such work. Both the University of Leeds and Leeds Trinity University have become involved with the Bambisanani Partnership. Led by Andy Lockwood, staff and students the University of Leeds have recently returned from South Africa where they pioneered a unique cycling project at Mnyakanya School, teaching students how to ride bikes safely and maintain them. In addition to this, the team delivered a Sports Leadership programme to over 150 primary school children and volunteered at Zulufadder Orphanage. In its tenth Anniversary year, the Bambisanani Partnership has ambitious plans to extend its work and influence. 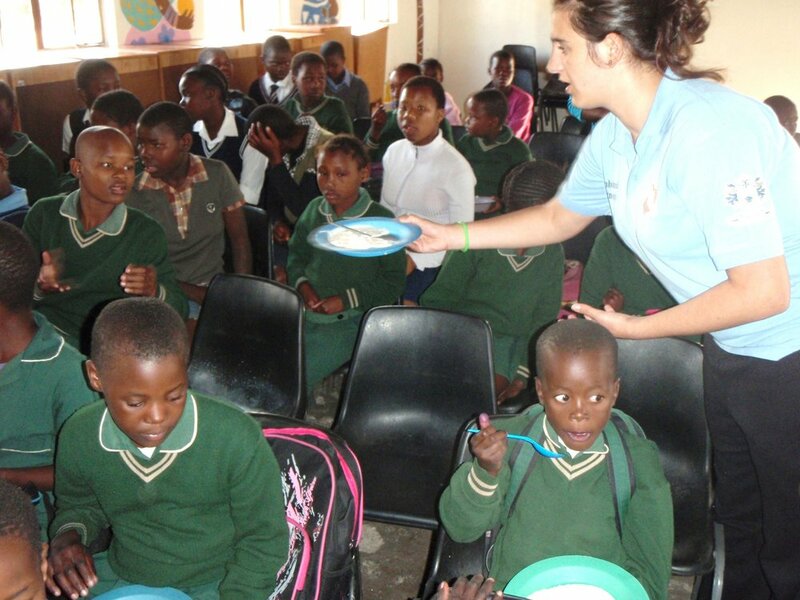 In addition to the annual exchanges, supporting students in need and the provision of a wide range of new learning activities in both schools, the charity is working with the University of Leeds and Leeds Trinity University to develop leadership programmes with its own students in South Africa. At Mnyakanya School the charity is currently working on the instillation of Wi Fi and computers to enhance teaching and learning in this remote rural area. It is also the aim to create a football pitch for the school and wider community on land nearby. The partnership's long term relationship with Zulufadder Orphanage will be developed through the building of a new Hostel for the most vulnerable of vulnerable children who need immediate care and accommodation. Additionally the partnership is also working with the South African Commission to the UK to help establish a Sport and Education Forum linking the UK and South Africa with the British Council and Youth Sport Trust to support other schools develop sustainable partnerships. Three remarkable books have been published about the work of the Bambisanani Partnership. The fourth book, Bambisanani: Ten Years of Working Together and Learning Together, is currently being written and will be published early next year. Older PostCardinal Plus Annual Golf Day 16 September 2016 will raise funds for The Bambisanani Partnership!